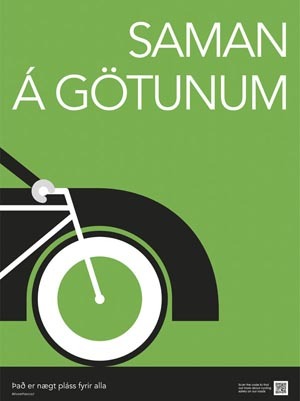 Icelandic Cyclists' Federation represents the interests of all cyclists in Iceland. Our official member organizations include three of the most active cycling clubs in Iceland, The Icelandic mountainbike club, The Cycling Club of Reykjavik and Hjólamenn. The Icelandic Cyclists' Federation was established in 1995 as an umbrella organisation for touring, commuting and sports cyclists in cooperation with a national body for non-competitive sports (Íþróttir fyrir alla), under the Icelandic Sports Association. The official name is Landssamtök hjólreiðamanna (in Icelandic), abbreviated LHM. Board members of the clubs under the umbrella have often had representatives in the board of LHM. LHM promotes cycling as a sustainable and healthy means of transportation and recreation, a competitive sport and a family-friendly non-competitive sports activity. LHM represents cyclists interests at the local and national level. LHM is a member of the European Cyclists' Federation. Íslenski Fjallahjólaklúbburinn ÍFHK - ( www.fjallahjolaklubburinn.is ) established 1989 was originally formed as a touring club. Nowadays it functions also as a club for urban cyclists. They arrange weekly leisurly evening rides on Tuesdays in Reykjavík and vicinity during the summer. The trips are open to all, free of charge. ÍFHK also arranges weekend trips of varying difficulty, and several courses are held on bicycle touring and bicycle maintenance and repair. Every Thursday the club-house at Brekkustígur 2, 101 Reykjavík is open from 20:00. Visitors touring Iceland on bikes welcome. They also have extensive online advice for cyclists planning to tour Iceland by bike. Hjólreiðafélag Reykjavíkur HFR ( www.hfr.is ) - is a club for sports-cyclists, first established (1924). HFR have regular training sessions all year. They arrange several competitions, both on tarmac and on gravel/off-road. HFR members have competed internationally, like in the small nations championships. HFR was instrumental in the establishment of the Cycling committee of the National Olympic and Sports Association of Iceland and oversee national championships. Hjólamenn ( /www.hjolamenn.is ) is a club for sports-cyclists, established in 2005. They have regular training sessions all year. They arrange several competitions, both on tarmac and on gravel/off-road. Members have competed internationally, like in the small nations championships. Hjolamenn have a representative in the Cycling committee of the National Olympic and Sports Association of Iceland.